A Time of Family Remembrances by Rev. Glenn Andes will be held Monday, April 15, 2019 at 10:45 A.M. followed by a Mass of Christian Burial at 11:00 A.M. at St. Joseph’s Catholic Church (5685 Main St., Gratiot) with Rev. Sudhakar Devarapu officiating. Burial will be in St. Joseph’s Cemetery in Gratiot. A visitation will be held Monday, April 15, 2019 from 9:00 A.M. until 10:45 A.M. at the church. The Erickson Funeral Home in Shullsburg is serving the family. Online condolences may be expressed to the family at www.ericksonfuneralhome.com. For those who prefer, a memorial fund has been established in Irene’s name. The family would like to give a special thank-you to Dr. Martin Cleary, Rev. Glenn Andes, and the nurses and staff at Lafayette Manor for their care and compassion for Irene. To send flowers or a remembrance gift to the family of Irene K. Gille, please visit our Tribute Store. 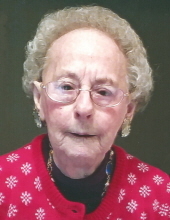 A Time of Family Remembrances will begin at 10:45 A.M.
Memorials may be written out to "the family of Irene Gille"
"Email Address" would like to share the life celebration of Irene K. Gille. Click on the "link" to go to share a favorite memory or leave a condolence message for the family.